The week of oatmeal. I am very much hoping my kids talk about this week for years to come. Presenting our children with meals has become tedious lately. "What is this?" and "Could you make this any healthier?" and "Seriously mom this looks like it grew feet and walked out of the garden, can we have something with a crust?" Ok so that insult was actually creative, but usually it is more along the lines of a turned up nose or rolled eyes. And some of these meals were basic fare not lovely baked fish or eggplant parm, the last straw was roasted chicken! SO not a mother to be a martyr, the Otis kids are enjoying oatmeal for the week. Yes they will have veggies and fruit for snacks and other meals, I am quite sure they will not perish (although I have heard arguments that they might). 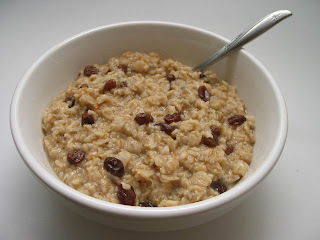 Old fashioned oats with raisins, cinnamon and real cream. 5 nights this week. No meat, no veggies, no spices and no curve balls. Oatmeal it is. Day 3 kids were looking longingly at our marinated beef tips with asian slaw. Yesterday the fish looked possible. My hope is that I get my table back, my polite eaters. My kids who are game to try a new food and polite to the cook who prepared it. Kids can slide into bad habits as quickly as adults. I simply lost my patience with subtle and not so subtle slams on my cooking. SO if you have some eaters with less than ideal manners try a week of oatmeal. Now THIS... THIS is a great idea. I've had to make different rules at the table for my six-year-old because it seems like the majority of our table time is spent listening to complaints and bargaining rather than enjoying a meal together. I don't know what happened that 90% of the stuff I serve seems unacceptable to him. They might turn into churches with how stoic they have been throughout the experiment:) But yes, I indeed meant to wither away. To Krista, I think there is a transition from the young toddler open mindedness to food and the preschool early school agers who shun the very food they used to love! Some have sent comments saying, let them eat fries! My kids all love you people by the way. Yes they eat fries occasionally and all the yummy things in moderation. Overall I stick to whole foods (actual chicken, stone ground oats, bulk basmati rice) for health as well as cost. Also, we are a big family but out foot print is lower with less packaging, cloth diapers and so on. Additionally I want to raise kids who can cook! We seem to be re setting our attitudes so I will follow up with how things are looking after our week of oatmeal. Packing & Road Trip Tips!